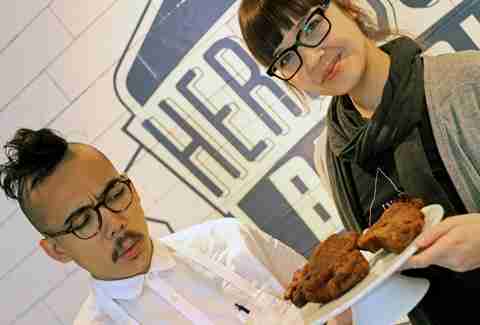 The term "vegan meat" initially comes off a bit oxymoronic, however, the idea has been picking up major traction as of late, especially for two Twin Cities locals who are about to open the country's first-ever vegan butcher shop, The Herbivorous Butcher. 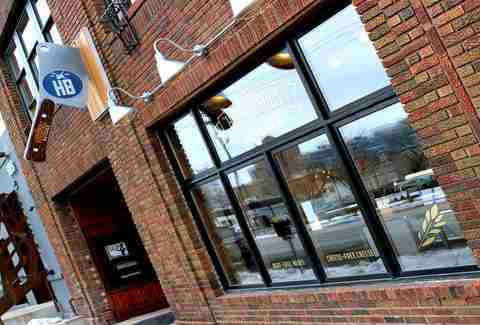 Aubry and Kale Walch are set to launch with a grand opening on Saturday, January 23rd. The event has drawn a lot of attention from all across the country with features in Food & Wine Magazine and the New York Times while simultaneously getting poked fun at by the likes of Jimmy Fallon. After raising close to $62,000 from a widely successful Kickstarter campaign along with some private investments, the social media hype continues to grow. Currently, they’re offering a 30-day "go vegan" challenge to Jon Stewart with an offer to donate a small percentage of proceeds to his farm sanctuary -- and there’s an active hashtag to try and get them an appearance on Ellen (#HBonELLEN). Just ahead of their opening, we were able to sit down and get the scoop on the upcoming shop, how it all developed, and where they plan to take their budding business in the future. What were you both doing pre-vegan meats? Aubry: I was a bookkeeper and office manager for a long time. I also co-owned a music-booking agency called Greenroom Music. I worked in music for 10 years and then after that I decided to go away from music where I just worked a regular job and then left that to move on to this. Kale: I was always kind of hoping to be a doctor all my life. I went to a camp when I was in 10th grade and I couldn’t even suture a banana, so it just wasn’t in the game for me, although I still have the handwriting of a doctor. After that, my dad was a pastor, so I thought I’d try that for a year, but didn’t work for me and it crashed and burned and now we’re making seitan every day, so what are you gonna do. Aubry: I called him one day and asked him to quit college to open a vegan butcher shop and he was like "OK," but I didn’t really think he’d do it. He never really liked anything I did when I was younger. He thought I had too many tattoos, but then he did and I was like uh oh, this better work! So no culinary background for either of you? Kale: We both always liked cooking. Aubry: He worked in a restaurant and I worked at Whole Foods for a few years, so a little bit. Kale: I was a server that would hop on the line when my food wasn’t coming up fast enough. 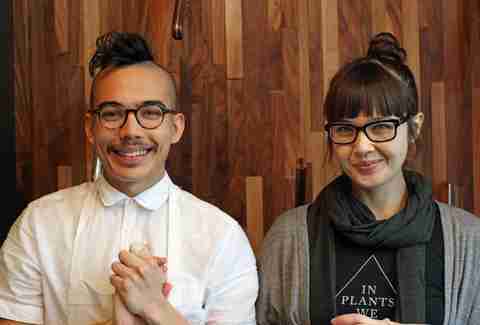 With no real culinary background, how did you manage to take the leap into vegan meats? Kale: Well, she was making them for a while before I did. Aubry: I’ve been making them for a long time. I went vegetarian when I was 14 and then vegan when I was 18 and then I teetered back and forth for a while. I was making the stuff for myself because I didn’t really like anything that was on the market. It didn’t really taste great and there wasn’t a lot of vegan options, it was all mostly vegetarian. I also didn’t really like products that had ingredients that I couldn’t pronounce and if I didn’t know what it was I felt kind of funny eating it. Then your recipes just came out of experimentation? Aubry: Oh yeah. Like anyone I Googled and got a basic seitan recipe and just sort of played with it from there. Like Kale says, most things are pretty bad at first. Kale: I did the same thing, although I went vegan five years ago. My dad and I used to travel the country looking for the best burgers and the best ribs and I had to have something that was pretty meat-like pretty quick or else I know I wouldn’t be able to stay vegan. And like Aubrey said, it sucked to start, but then you develop methods; you put juice in things instead of water or you smoke it over hickory chips instead of using liquid smokes and over time it started to get really, really frickin' good. Kale: Oh yeah. At first it was a health thing for me so I was doing it for my health. I had to lose weight real quick because I just couldn’t do anything. You started peddling your products at the local farmers' markets, how'd that go? Aubry: Really it was the only thing we could do at first. Kale: Oh yeah, we didn’t have any money. When we started we had my tip money and what little money she had saved up, and it was the only real affordable option really. Aubry: It was a way for us to test our products on the market without putting too much money into it. We really didn’t know what to expect at all. Did you have friends pushing you to get your products out there or was it just a personal decision to see if you could create a viable business model? Kale: Our friends would tell us that it was really good. Aubry: We did like, a little trial run after people kept telling us [the food was good]. We were like OK, let’s actually try this with people we don’t know and with people that actually eat meat to see what they think, so we did an eight-week trial with five to 10 different groups of people and gave them a survey at the end to find out what they thought of the texture and taste. From there we developed our first five products which were the smoky house ribs, the Italian sausage, the teriyaki jerky, deli bologna, and our pepperoni. Those were the first five, but then every week we’d introduce one new product as a testing mechanism and if people told us that they liked it, we’d make it again. We just really wanted to listen to what our customers wanted. 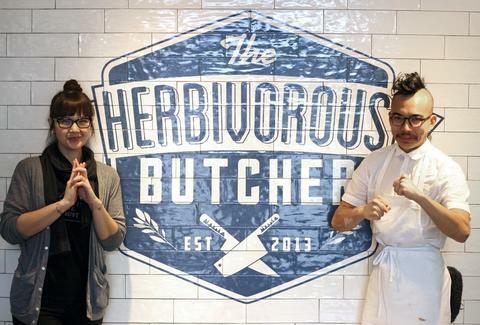 What sparked the idea to open a full butcher shop? Was that always the inevitable plan or did you think about going pre-packed retail? Aubry: It was always kind of the plan. Kale: Actually, at first we wanted to try to open a vegan sushi bar, but that was pretty high risk, especially since neither of us really ate fish growing up, so I don’t know why we thought of that. Aubry: Because it didn’t exist yet. Kale: Yeah, but this didn’t exist either. Aubry: We originally thought that we’d do the farmers' markets for about three years maybe and then we could upgrade or something, but it was really our customers that pushed us along and were like, you need to do this, you can’t make enough food where you’re cooking, and you’re sold out every time we get here. So, we ended up having a guy come by who happened to turn out to be our investor. He owns 33 assisted-living facilities in the United States, building two in England, his name is John Goodman of the Goodman Group. They’re trying to switch all of the seniors' diets over to the vegan diet, slowly. They’re actually working with the Mayo Clinic on the initiative and the goal is to help get them off all of their medications; heart medications, diabetes medications, and to be able to live life without having to suffer through a bunch of side effects. Kale: Let food be thy medicine! You got an early push online with your Kickstarter and the media, how did that help? Aubry: Well, we did the Kickstarter because our investor said, "Why don’t you raise all the money that you can and then let me know what more you need?" I was hoping he wasn’t really looking for a lot because we didn’t think we’d raise a lot of money on Kickstarter. But, the thing about the Kickstarter is that we had grassroots things going on here in Minneapolis, and it kind of helped to develop it all across the United States, just connecting us to other people across the country. And we really just wanted to know what everybody thinks and that’s really important to us and we wouldn’t be here if it wasn’t for those people. Kale: And the Kickstarter helped spur Jimmy Fallon to make fun of us which just kind of made things snowball. Has all the online attention created any hurdles in getting things started? Aubry: Not necessarily hurdles. It’s funny, we get so many requests for shipping right now and we don’t want to run before we can walk... so we’re trying to do some limited stuff. Kale: We get more emails from Europe and Canada than we do from people here. It’s crazy. Aubry: Yeah, franchising requests are coming from all over the world like Lebanon and Dubai and other places that we’ve never even heard of. Do you have plans for the future for any kind of massive expansion? Kale: We’re hoping to first open a satellite in maybe Duluth or something like that as just like a test, but we’re going to hit the coasts for sure. Maybe the West Coast, then the East Coast, and then the South. Then hopefully international soon after that with franchises and things like that. Each of the facilities will source their ingredients exclusively from their surrounding states, because that’s one thing we’re learning, that shipping is a beast. Aubry: It will also help us to decrease our carbon footprint that way and we can use the farmers in those areas to help keep those communities strong as well. Let’s talk about the process for making vegan meats. Tell us a little about what goes into each of your products. Kale: It’s very much like making dough. A very muscular dough is often how I like to describe it. So we use a vital wheat gluten which is a high-protein wheat flour and from there it’s using different blends of juices, beans, and different flours. We just combine dry and wet ingredients until we get this mass that we can shape into a bunch of different shapes. Sausages, steaks, chops, fish... well, I haven’t figured out fish yet, but I’m working on it. It’s a lot of fun, and different seasonings can make tons of flavors, and different amounts make different textures. Being a vegan, how do you go about trying to match flavors and textures? It’s not like you can eat the real-meat equivalents. Do you have taste-testers? Kale: I went vegan five years ago, but it feels like it could’ve been yesterday so I still remember a lot of the textures. I mean, when I went vegan, I needed everything to be spot on. For other things, our dad tries it out for us. Aubry: Yeah, if he doesn’t take a second bite, we know it’s no good. Kale: We’ve got other people too. A lot of our customers our omnivores and they let us know if something isn’t quite up to par. What was the last thing that didn’t really work out? Kale: Oh yeah, the salami. They told us that it just wasn’t quite there. The shape was wrong, the color was off, and the flavor just wasn’t right and I took it to heart and I’ve been trying to work on it ever since. Aubry: That’s something that’s really awesome about our customers. They tell us exactly what they think and they know that we’re going to try to go back and fix it. It’s just a really cool relationship that we have. Kale: They’re really a part of the mission. They feel like they’re a part of this movement instead of just supporting a local business and they’re actually doing both. It’s really why we started and it’s more of a mission then anything. You know, we have to keep our doors open and our people fed, but beyond that, it’s what we want to do. How many products do you plan on carrying in the shop? Aubry: There are 46 or so that we’ve made already. We’ll have 12 products in the meat case and then probably about five cheeses in the cheese case and they’ll rotate out. We’re also going to have some take-and-bake items, so you know, family-sized enchiladas, pot pies, and things like that that people can take home and we’ll also do one daily lunch special. We won’t have any seats due to licensing issues, but we’ll basically just operate as a butcher shop. We’re also big enough to be able to supply the assisted-living facilities and to ship everywhere. What's the learning curve like for people who are looking to switch to vegan meats? How different are they to prepare than regular meats? Kale: It’s a relief for a lot of our omnivore customers because they don’t have to worry about foodborne illness. All of the stuff is fully cooked, but not so much that they can’t do what they want with it. The ribs you just warm up and the Italian sausage you could eat right out of the package, but throw it in a pan with some olive oil and it’s great. So yeah, there’s not really much of a learning curve. Aubry: Yeah, we just tell people to treat it like the animal counterpart. It’s pretty comfortable and on our website. Once we have some more time, we’ll put some recipes and things up there. 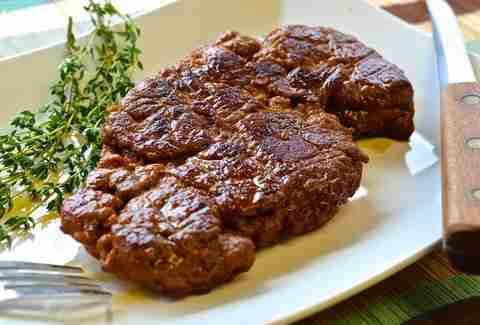 Do you see a big future for vegan meats? Kale: Back when I went vegan, even then it was hard to avoid all the videos that crazy vegans were posting on Facebook, but now it’s everywhere. Everyone’s putting them up and everyone knows. Even if people just do a meatless Monday, they’re taking a small step. Aubry: It does seem like people are starting to change a little bit and it makes me really excited to be a part of this movement at this time. Sign up here for our daily MSP email, and be the first to get all the food/drink/fun the Twin Cities have to offer. Keane Amdahl is a Twin Cities-based writer. Follow him on Twitter: @Foodstoned.